Wouldn�t it be nice if our money could grow tax free for the rest of our lives? That is possible if we invest in Roth IRAs. Our investments in Roth IRAs will double and double again many times, if we start investing in them early in life � and can make us financially secure by the time we retire. I started earning for my Roth IRA when I was 12. Roth IRAs are individual retirement accounts which are funded with �after-tax� dollars. That means there is no �up front� tax benefit from investing in Roth IRAs, but all the growth in the accounts is tax free. If we begin to invest early in our Roth IRAs, they could double as many as seven or eight times before we retire, generating huge financial gains for us. And when we retire, all the funds invested in and earned by our Roth IRAs can be withdrawn tax free. Roth IRAs are governed by rules and expectations first established in 1997 when legislation sponsored by Senator William Roth of Delaware, was passed � becoming effective in 1998. Purpose: The money invested in a Roth IRA is meant for retirement. If invested early it will compound many times. All the money directly invested in our Roths can be withdrawn at any time without penalty. Under certain conditions, funds earned on our investments can be withdrawn early without penalty. However, early withdrawal eliminates the huge gains that are possible by long, sustained investment. Certain withdrawals would be subject to penalties. Age, Earned Income and Investment Limits: While there is no minimum age for investing in a Roth IRA, money invested in a Roth IRA must be earned income. It does not have to be the same dollars actually earned, but the investment in a Roth cannot exceed the amount actually earned. For example, if you earn $100, that is all you can invest in your Roth IRA, even if you received $150 more in gifts during the year. However, you could take $100 from the $150 in gifts, and invest that in your Roth IRA. There are two kinds of earned income: W-2 income and �self-employment� income. You make W-2 income when you work for an employer that takes tax withholdings from your pay. Older kids may have W-2 income, but younger kids are likely to be self-employed. Your self-employment income needs to be legitimate and fair. In other words, our parents, guardians and/or grandparents (or others) should not pay us higher amounts than they would pay others to do the same work; and we should try to do the work to similar standards. If a lawn service would mow our yard for $20,00; we should not be paid more than that, and possibly less because our costs are reduced (we don�t provide the lawn mower, gas is paid for us, we don�t have to travel to the work site, we don�t have expenses maintaining equipment, and so on). Time Restrictions: All money invested for a calendar year must be money earned during that year. We have until April 15 of the following year to make our Roth IRA contributions for the previous calendar year. Or, during the current calendar year, we can make monthly or periodic contributions to our Roth IRAs. We don�t have to wait until the next calendar year to make our contributions. After-Tax Dollars: As already noted, the contributions to our Roth IRAs also need to be �after-tax� dollars. In other words, if our earnings are high enough to be subject to Income,, Social Security and Medicare taxes, we need to pay those taxes and can only invest the dollars that are left after paying the taxes. In 2011 we only can invest a maximum of $5000, and if our earnings are VERY high, we may not be qualified to invest in Roth IRAs at all, but most kids will not face this latter problem. For more information, please see: Paying Taxes. Custodial Accounts: Since we are kids, when we open our Roth IRAs they will have to be �custodial� accounts. That�s because we have not reached the age of majority (18 in most states). A parent or guardian or even maybe a grandparent will have to be the custodian of our account until we are 18. They will make �trades� for us in our account. But since these are our Roth IRAs, we need to be closely involved in making any decisions on how to invest our funds. Record Keeping: We should keep records of our earnings � noting date worked, for whom, job completed, and amount paid. These records should be kept as documentation of what we earned and how we did it. If our earnings are high enough to be subject to taxes, these records will help us file our taxes. Then we should keep a copy of these records with a copy of our filed taxes. For more information, please see: Keeping Records. For a list of disadvantages and advantages of Roth IRAs, please see: Advantages and Disadvantages of Roth IRAs for Kids . Once we have legitimate earned income, have documented our earnings, and paid taxes that are due, we are ready to open a Roth IRA. Roth IRAs can be opened at many different kinds of financial institutions, ranging from banks and credit unions to discount brokerage companies. If the person that will be custodian of our account � parent, guardian, grandparent, etc. � already has accounts with a specific bank, credit union, or broker, our custodian should check out policies at those institutions for opening our custodial account. Some may have �minimum� account requirements that are too high for our initial investment in our Roth. For example, some banks and credit unions will have a minimum IRA account size of $1000; some discount brokers will not allow us to open an account with less than $500. When I opened my Roth IRA, my grandfather helped me open an �equities� account with a discount broker � one with whom he already had an established relationship. However, that broker had a minimum account size of $500. It was very difficult for me, when I was 12, to earn enough money � after taxes � to have that amount of money to open my account. However, since I opened my Roth IRA, I�ve found simpler, easier, and much less demanding ways to open Roth IRA accounts. Please see: Article: Roth IRAs for Kids: Starting Them at Credit Unions. 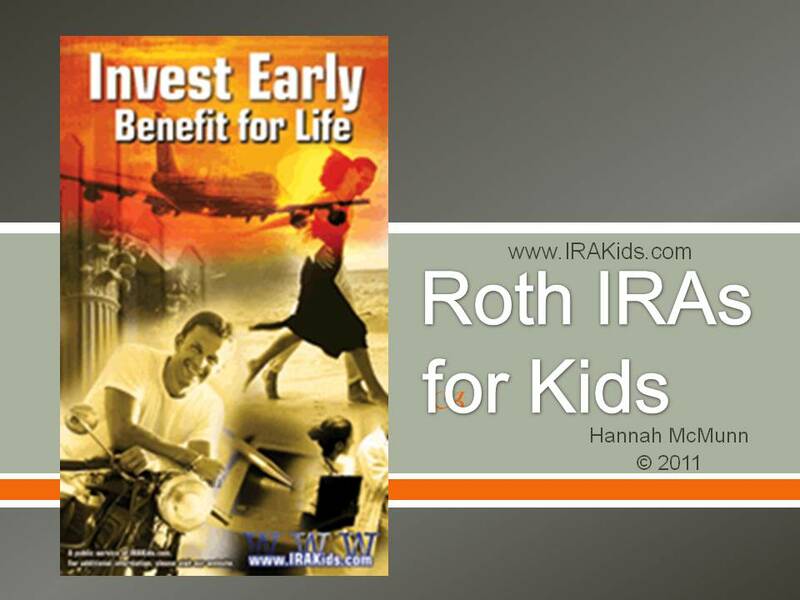 Article: Roth IRAs for Kids: Roth IRA Guidelines and Opening an Account, by Hannah McMunn and C. Edward Wall, reviews the purpose and potential of Roth IRAs. 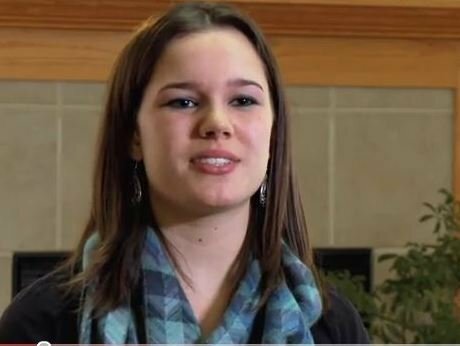 Hannah (age 16) explains the need for earned �after-tax� income to open an account; the ability and limitations on withdrawing funds early from an account; the requirement that a kid�s Roth IRA be a �custodial� account; and the need to keep good records. She provides links to sources of further information on keeping financial records and paying taxes. She also briefly describes how she set up her own Roth IRA and notes that there are easier ways to establish them than by the method her grandfather chose for her. This article is made available for educational and republication courtesy of IRAKids.com.